The Foundation of an Autonomous Colony on another cosmic body is one of the most challenging tasks for humanity. Though it requires enormous effort, the goal to expand the influence of mankind throughout the Solar system is worthwhile. This motivation has several aspects. 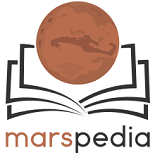 This page covers general issues of an autonomous colony on Mars. 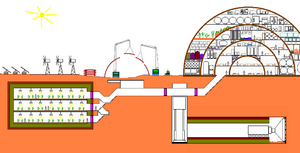 Colony with dome buildings and underground facilities. What is an autonomous colony? The main attribute is independence from Earth. Once the colony is set up, it provides a habitat for settlers on the long run, hopefully forever. The second attribute is a planned and indefinitely stable colony that can thrive from local resources. Unlike a mission with planned death the settlers in an autonomous colony have a future for themselves and for their Mars-born children. The ultimate expression of independence from Earth may be the complete political independence of a colony. Bringing down Phobos before a settlement is built may help to make Mars safe for the long term. The transport of colonists from Earth to Mars is a very complicated part of the plan. There are many threats inherent to space travel: Solar & Cosmic Radiation, Meteorites, Physical & Mental Illness, etc. Plans will need to be made to deal with every possible problem. Since people can not live in the natural environment a basic artificial habitat with houses, supplies and equipment for a long term stay would be deposited on Mars' surface. The equipment must be technologically sufficient to allow the colonists to grow their own food, build new houses, etc. There are many uncertainties about the impact of the Martian environment. The equipment would be tested on Earth thoroughly, but the influence of the Martian environment cannot be understood completely on Earth. The safest way is an unmanned setup of a whole settlement by an automated and remote controlled machinery. Energy is the most critical resource. It is needed for lighting and heating of greenhouses, for metallurgy and production of machines. The critical path is the generation of enough energy for the production of spare parts for the energy generating systems and greenhouses. In other words: If the energy generating systems and greenhouses can not be maintained endlessly with the amount of energy they produce, an autonomous colony is not feasible. The preparation cost for a mission like this is tremendous. A financial effort estimation helps to get an overview. Within a small group of colonists, a daily council of all members may be sufficient to address the needs of governance, much in the tradition of the New England town hall meetings. In a growing community some kind of representative democracy may become necessary, although this type of government may not be well suited to a small colony in a hostile environment. As the number of members in a martian population grows, so will the number of deaths. It will become necessary to conduct funerals. Before heading for Mars any crew is quarantined to ensure they do not suffer from infectious diseases. As a result, the Martian colony should be more or less free from pathogenic germs, which saves medical effort. However, for children born on Mars an even more effective vaccination program will be necessary to stimulate the development of Mars-born immune systems. The size of the human population must not be too small due to the risk of inbreeding depression. This can be positively influenced through the use of in-vitro fertilisation from genetic stock for the first child born to every colonial family. Increased exposure to radiation may increase the incidence of cancer. Colonists will need shielding from radiation during transport from Earth to Mars and on Mars' surface, due to the thin atmosphere and lack of a planetary magnetosphere. Compared with Earth the limited industrial performance of an autonomous colony does not allow the same level of medical care. High sophisticated accessories for surgery and a great variety of drugs are impossible to produce. Alternatives to standard medicine considered taboo on Earth may be forced upon the growing settlement, such as the use of genetically altered pig organs in emergency transplants. Can there be enough energy generated, necessary for infinite maintenance? What is the public attitude to such a foundation? What skills and technologies are needed to have a small self-sufficient economy rather than a 6-billion-person global economy with its highly interdependent and very specialized jobs and technologies?